Many Players Are At Home In The Arcades, But Will The Arcades Ever Be At Home At Home? Arcade game players are loyal to their machines, their scene, their big scores. Often they will tell you that the home game versions of the games they play just don’t match up to the thrills of the arcade version. These players see the arcades as the big leagues, where the big games are played…everything else is bush league. They’re right in that some home games are simplified versions of arcade games, and as such don’t hold that much appeal to the veteran arcade player. But they’re wrong in thinking that a game in an arcade is the toughest challenge of all. There are many computer games that are tougher than anything you’ll ever play in an arcade. Part of this misunderstanding by arcade players of the home games comes from not knowing enough about the computers that run their games. The more powerful the computer, the more powerful the game program that can be written for it. 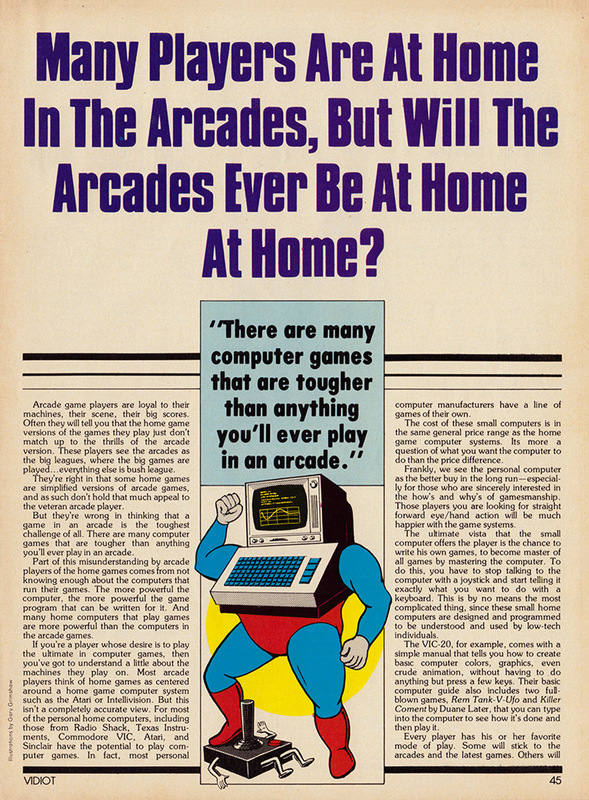 And many home computers that play games are more powerful than the computers in the arcade games. If you’re a player whose desire is to play the ultimate in computer games, then you’ve got to understand a little about the machines they play on. 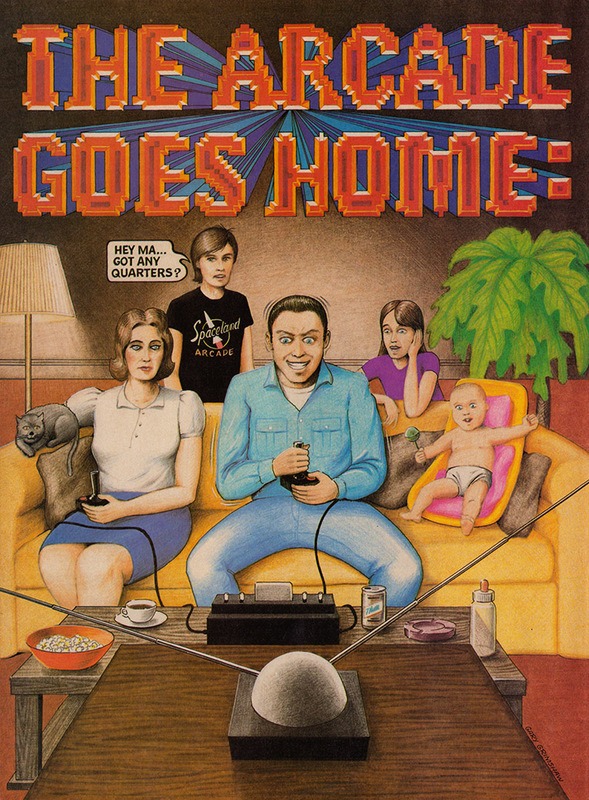 Most arcade players think of home games as centered around a home game computer system such as the Atari or Intellivision. But this isn’t a completely accurate view. For most of the personal home computers, including those from Radio Shack, Texas Instruments, Commodore VIC, Atari, and Sinclair have the potential to play computer games. In. fact, most personal computer manufacturers have a line of games of their own. The cost of these small computers is in the same general price range as the home game computer systems. Its more a question of what you want the computer to do than the price difference. Frankly, we see the personal computer as the better buy in the long run—especially for those who are sincerely interested in the how’s and why’s of gamesmanship. Those players you are looking for straight forward eye/hand action will be much happier with the game systems. The ultimate vista that the small computer offers the player is the chance to write his own games, to become master of all games by mastering the computer. To do this, you have to stop talking to the computer with a joystick and start telling it exactly what you want to do with a keyboard. This is by no means the most complicated thing, since these small home computers are designed and programmed to be understood and used by low-tech individuals. The VIC-20, for example, comes with a simple manual that tells you how to create basic computer colors, graphics, even crude animation, without having to do anything but press a few keys. Their basic computer guide also includes two full blown games, Rem Tank-V-Ufo and Killer Coment by Duane Later, that you can type into the computer to see how it’s done and then play it. Every player has his or her favorite mode of play. Some will stick to the arcades and the latest games. Others will realize that home games have advantages, and can be great. 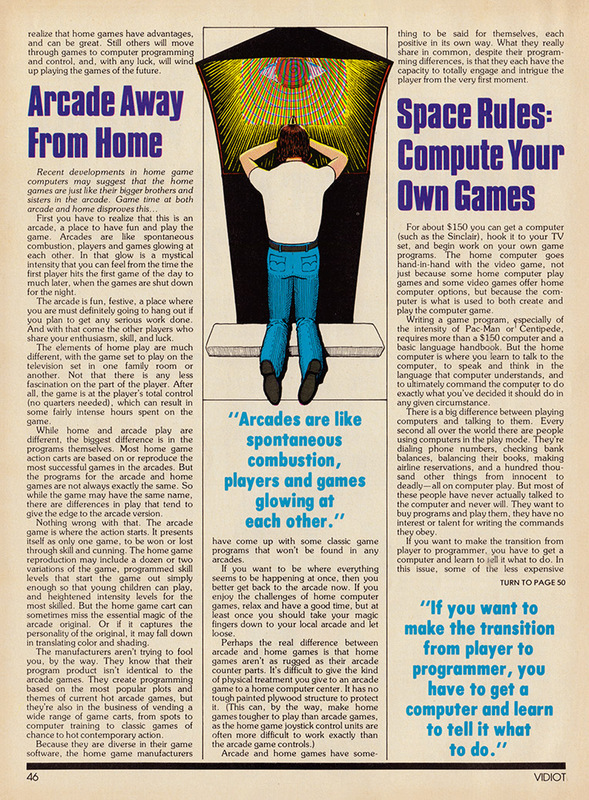 Still others will move through games to computer programming and control, and, with any luck, will wind up playing the games of the future. First you have to realize that this is an arcade, a place to have fun and play the game. Arcades are like spontaneous combustion, players and games glowing at each other. In that glow is a mystical intensity that you can feel from the time the first player hits the first game of the day to much later, when the games are shut down for the night. The arcade is fun, festive, a place where you are must definitely going to hang out if you plan to get any serious work done. And with that come the other players who share your enthusiasm, skill, and luck. The elements of home play are much different, with the game set to play on the television set in one family room or another. Not that there is any less fascination on the part of the player. After all, the game is at the player’s total control (no quarters needed), which can result in some fairly intense hours spent on the game. While home and arcade play are different, the biggest difference is in the programs themselves. Most home game action carts are based on or reproduce the most successful games in the arcades. But the programs for the arcade and home games are not always exactly the same. So while the game may have the same name, there are differences in play that tend to give the edge to the arcade version. Nothing wrong with that. The arcade game is where the action starts. It presents itself as only one game, to be won or lost through skill and cunning. The home game reproduction may include a dozen or two variations of the game, programmed skill levels that start the game out simply enough so that young children can play, and heightened intensity levels for the most skilled. But the home game cart can sometimes miss the essential magic of the arcade original. Or if it captures the personality of the original, it may fall down in translating color and shading. The manufacturers aren’t trying to fool you, by the way. They know that their program product isn’t identical to the arcade games. They create programming based on the most popular plots and themes of current hot arcade games, but they’re also in the business of vending a wide range of game carts, from spots to computer training to classic games of chance to hot contemporary action. 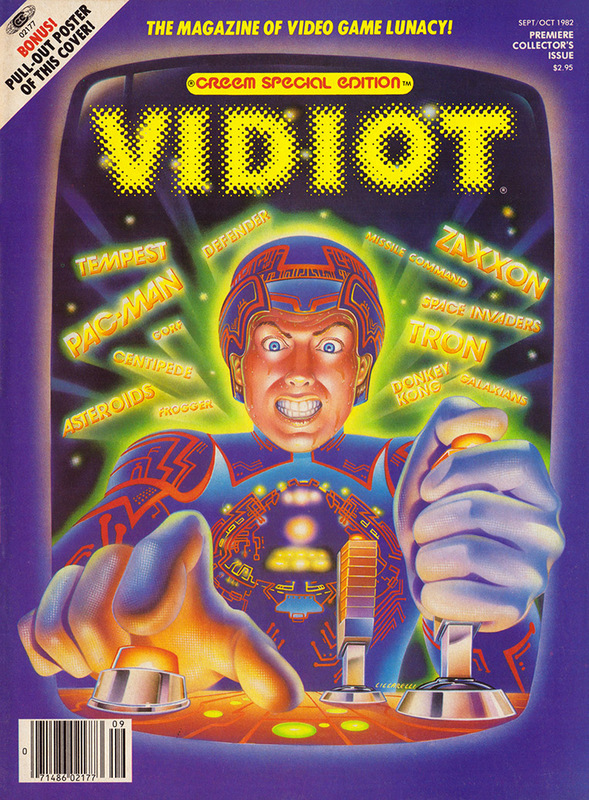 Because they are diverse in their game software, the home game manufacturers have come up with some classic game programs that won’t be found in any arcades. 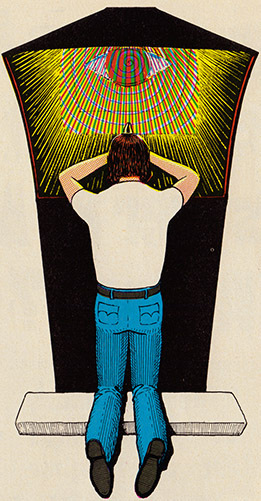 If you want to be where everything seems to be happening at once, then you better get back to the arcade now. 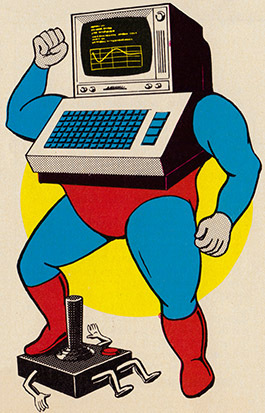 If you enjoy the challenges of home computer games, relax and have a good time, but at least once you should take your magic fingers down to your local arcade and let loose. Arcade and home games have something to be said for themselves, each positive in its own way. What they really share in common, despite their programming differences, is that they each have the capacity to totally engage and intrigue the player from the very first moment. For about $150 you can get a computer (such as the Sinclair), hook it to your TV set, and begin work on your own game programs. The home computer goes hand-in-hand with the video game, not just because some home computer play games and some video games offer home computer options, but because the computer is what is used to both create and play the computer game. Writing a game program, especially of the intensity of Pac-Man or Centipede, requires more than a $150 computer and a basic language handbook. But the home computer is where you learn to talk to the computer, to speak and think in the language that computer understands, and to ultimately command the computer to do exactly what you’ve decided it should do in any given circumstance. There is a big difference between playing computers and talking to them. Every second all over the world there are people using computers in the play mode. They’re dialing phone numbers, checking bank balances, balancing their books, making airline reservations, and a hundred thousand other things from innocent to deadly—all on computer play. But most of these people have never actually talked to the computer and never will. They want to buy programs and play them, they have no interest or talent for writing the commands they obey. If you want to make the transition from player to programmer, you have to get a computer and learn to tell it what to do. In this issue, some of the less expensive computers are examined, and their potentials described. Don’t, however, let people who don’t know anything about it scare you off by telling you that writing computer programs is too hard. It’s not at all difficult. What is a tough act is writing really brilliant, useful, bug-free programs. But that’s the same as playing the guitar and writing hit songs or owning a movie camera and winning an Oscar. These days a basic computer with keyboard and memory costs about the same as a cheap guitar or a cheap movie camera (and a good deal less than any video equipment you might want to get your hands on). So if you can find some way to finance your first keyboard, the rest is up to you. It is an extremely simple process to interconnect a home video game system to your TV set. Don’t let all the cables with their implied technology fool you—there are only three basic elements which have to be put together before you can get down to some serious playing. First there’s the computer module, the heart of the game system which has the on-off, power, game select, and game re-set controls. The computer module is where the particular game cartridge is plugged in. In addition, the controllers for play and the cable TV set must find their way to the computer module. Depending on the power supply set-up, the computer module or a DC transformer is plugged into the AC line, and into the module to supply power to the module. Then the control stations are plugged by their cables into the module. The controllers can be of various configurations, including dial, switch, pushbutton, and joystick controllers and combinations of these controls. Now the TV generated by the computer module is run along another cable to the TV antenna inputs of the TV set. This is an rf signal, often on either channel 2 or 3, and the TV set must be tuned to that channel to receive the audio and video computer noises produced by the computer. That’s the set-up. No more difficult than connecting up a stereo system or a video cassette recorder. Once the system is in place, the particular video cartridge you want to play is put into the tape head sl0t in the module, in much the same way an audio cassette or eight-track are inserted into a tape recorder. With the cart in place, the game begins. The screen will flash with the first game of the series on the cart. You can then review all the game variations available to you, and with the game select and game re-set switches on the module, select the particular game you want to play. Computer games and arcade machines are nowhere near as challenging as the ultimate computer games—those that are written as programs for play on the more sophisticated home computers. The technical stuff is that the computer games and arcade machines aren’t equipped with the kind of memory capacity and storage that a real home computer has with its 48K RAM memory and one or two disc drives. Because the games are limited in their computer capacity, they cannot ultimately achieve the complications and complexities that are possible with the home computer. This includes both program strategy and detail of graphic display—for both of these important game elements are directly related to the computer’s capacity. A single chip in the original Pong game produced a simplistic display and limited action; the computer memory of a Pac-Man game challenges you to beat a million as you observe the colorful subtleties of the TV art. The expensive home computer can step beyond even this; with the proper programs the graphics take on a dimensional quality with genuine detail, and the game plan steps beyond the boundaries of eye/hand coordination. This is perhaps the most significant step forward. A third dimension has been added to the program: the necessity of using the brain to outwit the computer. Of course the brain is needed in the eye/hand game, but only as the coordinator of physical actions. 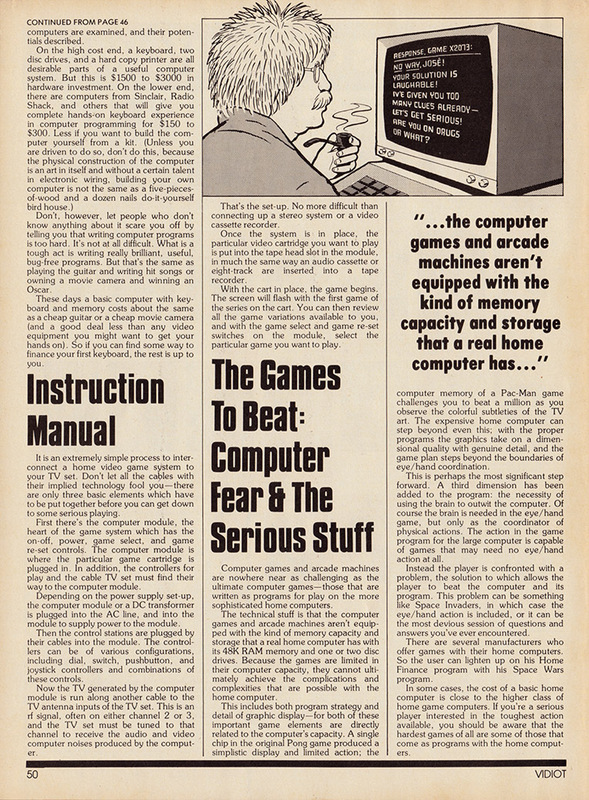 The action in the game program for the large computer is capable of games that may need no eye/hand action at all. 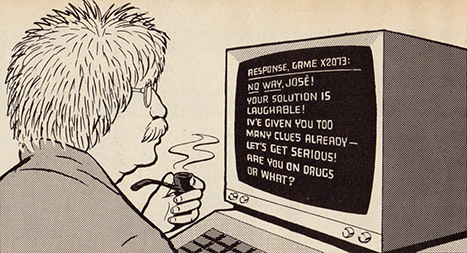 Instead the player is confronted with a problem, the solution to which allows the player to beat the computer and its program. This problem can be something like Space Invaders, in which case the eye/hand action is included, or it can be the most devious session of questions and answers you’ve ever encountered. There are several manufacturers who offer games with their home computers. So the user can lighten up on his Home Finance program with his Space Wars program. In some cases, the cost of a basic home computer is close to the higher class of home game computers. If you’re a serious player interested in the toughest action available, you should be aware that the hardest games of all are some of those that come as programs with the home computers.